A sunny day on September 11th in the mid 60's, does anyone remember that strange tradition of having the jelly & ice cream as a first course at Birthday parties? 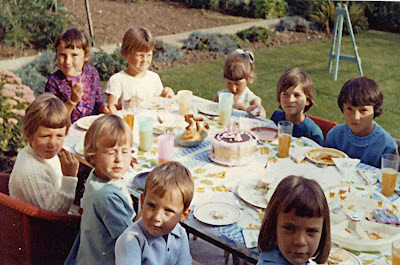 Here I am with my little brother, Alison, Gilly S, Gilly T, Linda, Shirley, Lisa and the mystery girl in the foreground with the scary fringe. I have wracked my brain to remember who she is, so if you are that person do get in touch! It is not like me to forget names or faces, but she has me foxed! There is a clue as to my Birthday pressie that year.. a gorgeous blue easel can be seen in the background, possibly by Triang? Well here is mine in all its shabby glory, complete with "misty" view into the interior thanks to a neighbours bonfire this afternoon! How am I going to part with this Hydrangea head fabric? This is one of many (Mr W would say "too many") Lloyd Loom chairs where I can sit & sew... weather permitting. NB :The cushion is not for sale, it was a purchase from the recent Honiton Textile fair. A girls has got to have a treat sometimes, I thought the fabric looked a bit "Silver Studio" what do you think? 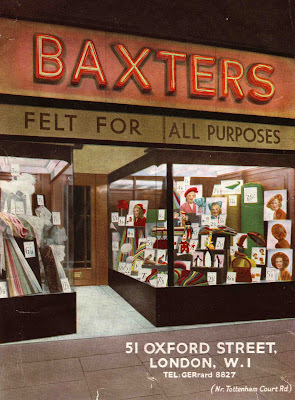 These images are from a selection of catalogues from a shop in London called Baxters, which was based at number 51 Oxford Street. The invoice inside one of the leaflets is dated 23rd November 1951. 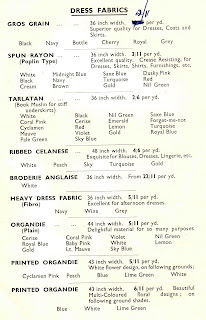 The dress fabrics are listed, and include such temptations as "Printed Organdie......Slipper Satin.... 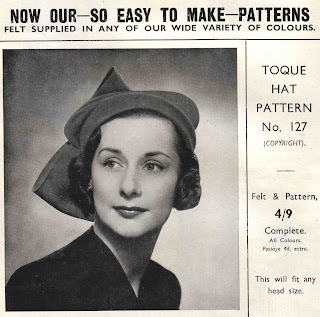 Printed Egyptian cotton.. Glitter Georgette......Metal Brocades (Made in France) and of course Felt in 52 Glorious colours"
There are patterns for toys... slippers.. handbags.. Bonnets & Berets. It has been such fun to sift through all these treasures. 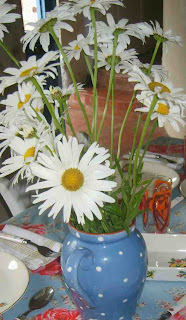 I have now decided which to keep and the rest will be going with me to Rag Fair in the village of Chagford (near Exeter) on October 3rd. 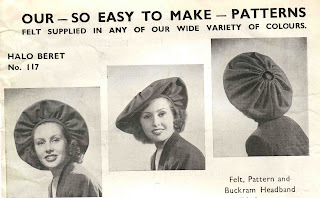 A possible date for the diary if you enjoy sewing, making things & crafts? Oh yes, and the 1930's salad servers that I have had forever..... may have come from a jumble sale in the 1970s? Linen checked napkins, much nicer than paper I think.